A consortium of powerful arms dealers from India and Israel was deployed by cash-strapped Israeli defence equipment companies to swing the Rs10,000 crore medium-range surface-to-air missiles (MRSAM) deal with the defence ministry. The contract was signed on February 27 with Israel Aerospace Industries (IAI), and it included a controversial payment of Rs600 crore (6% of contract value) as "business charges". Sources told DNA that the actual amount of illegal commission paid may have been even higher at 9%, and two of India's powerful arms dealers may have joined hands with two of Israel's in closing the deal on the eve of the elections. The contract includes joint development of the missiles in association with the Defence Research & Development Organisation (DRDO). In a series of investigative articles over the past week, DNA showed how the UPA government pushed through the controversial deal with IAI, which is already under investigation by the Central Bureau of Investigation (CBI) in the Barak missile scam of 2000. Despite initial vigilance worries, vague legal opinion and negative consequences for the indigenously-produced missiles in the same class, the government went ahead with the deal and asked IAI to keep quiet about it for a while. DNA's disclosures forced the deal out in the open. 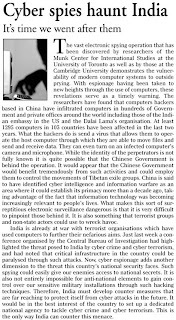 The key arms dealers involved are said to be Sudhir Choudhary and his associates, on behalf of IAI. Suresh Nanda, son of a former navy chief, was deployed on behalf of Rafael, which will end up getting over Rs3,000 crore in the deal. Both Choudhary and Nanda were named in the CBI's FIR filed in 2006 in the Barak scandal. The key arms dealers involved in the Rs10,000 crore MRSAM deal with Israel Aerospace Industries are said to be Sudhir Choudhary and his associates, on behalf of IAI. Suresh Nanda, son of a former navy chief, was deployed on behalf of Rafael. Sudhir and his brother Susheel are the most powerful arms dealers in India. They also enjoy great proximity to a Union minister. According to two different sources in the arms industry, the total commission for the arms agents could be as high as 9%. If one were to assume that the 6% business charges are substantially about commissions, the actual payment would be in the range of Rs 900 crore at 9%. IAI and Rafael have a contract to share work amongst them. Rafael would be making the Barak VIII missile for the MRSAM system, dependable sources said. The Israelis had also fielded Elul group, which has been active in India for the Israeli arms companies. Officially, Elul Asia acknowledges a marketing tie-up with Rafael and receipt of millions of dollars for their services in India. Meaning, they have been paid crores for getting Rafael defence deals from India, despite India's laws banning middlemen. According to DNA queries, Elul group and its chief David Kolitz have also been active on the deal. Israeli sources admit the deal will help IAI, which is in deep financial trouble. This will be the single biggest boost in recent memory for the firm. The US military leadership will now decide which tools Pakistan needs in the war on terror and not the Pakistani Army, unlike in the past when Islamabad purchased fighter jets, primarily targeting India, from the counter-terrorism aid received from Washington. 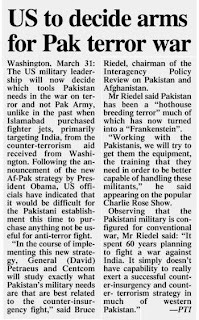 Following the announcement of the new Af-Pak strategy by President Barack Obama, US officials have indicated that it would be difficult for the Pakistani establishment this time to purchase anything not be useful for anti-terror fight. Concerns have been expressed from various quarters earlier about diversion of anti-terror funds by Pakistan to buy equipment more suited for conventional warfare. "In the course of implementing this new strategy, General David Petraeus and CENTCOM will study exactly what Pakistan's military needs are that are best related to the counter-insurgency fight," said Bruce Riedel, chairman of the Interagency Policy Review on Pakistan and Afghanistan. Ridel said Pakistan has been a "hothouse breeding terror" much of which has now turned into a "Frankenstein". "Working with the Pakistanis, we will try to get them the equipment, the training that they need in order to be better capable of handling these militants," he said appearing on the popular Charlie Rose Show. Observing that the Pakistani military is configured for conventional war, Riedel said: "It spent 60 years planning to fight a war against India. It simply doesn't have capability to really exert a successful counter-insurgency and counter- terrorism strategy in much of western Pakistan." Referring to the fact that western Pakistan is a huge barren area, Riedel said: "One thing they need, for example, is air mobility. If you are going to try to control these border regions, you need significant numbers of helicopters." vision equipment, and training and equipment specifically for Pakistani Special Operation Forces and their Frontier Crops,"
"The situation in Afghanistan is a tough one. This is a country that has been at war for 30 years. The situation in Pakistan is equally if not even more difficult. This is a country with a profound socioeconomic problems, which has had a history of political weak relations between the military and civilian authority. There are dangers here," Riedel said. "Pakistan has been a hothouse breeding terror for the last three decades. Much of that terror is now a Frankenstein which threatens Pakistan's own freedoms. We need to help the Pakistanis develop the capabilities to fight against them and to work with them," he said. Monday’s suicide bomb attack on the Police Training School in Manawan, near Lahore, which came soon after a similar daring strike at the Sri Lankan cricket team on March 3, underlines the challenge the Pakistan-based jihadi elements pose to peace and stability in the region. The well-entrenched terrorists in Pakistan have proved that they can strike at will, anywhere, anytime. Earlier, their focus was the tribal belt along the border with Afghanistan. Now, it seems, Lahore and the surrounding areas are on their radar screen. Lahore, after all, is the nerve-centre of politics in Pakistan. After an eight-hour battle with the militants, Pakistan’s security personnel have succeeded in capturing at least three of the attackers. This may help the authorities in getting at the bottom of the truth. No such arrest could be made when the Sri Lankans were targeted. Interestingly, the chief of the Pakistan Taliban, Baitullah Mehsud, has taken the responsibility for the killing of eight cadets of the police training academy. He is a Waziristan-based tribal chieftain and also a key operative of Al-Qaida. There is a strong nexus between the terrorist outfits like the Lashkar-e-Jhangvi based in Punjab and those having their bases in the NWFP. Obviously, the Taliban activists apparently used the opportunity provided by the deal between their counterparts in Swat and the government to regroup themselves to do what they have done. They have torn into pieces Islamabad’s policy of reaching agreements with the elements bent on implementing their destructive agenda. 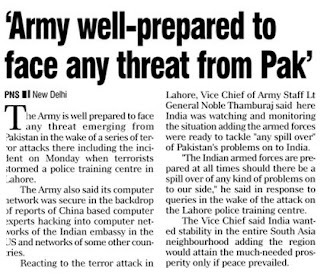 Pakistan will have to show the required seriousness in handling terrorism. A soft approach in dealing with those who have no appreciation for such a course of action will not do. The situation is getting alarming for India, as Monday’s incident occurred at Manawan, hardly 12 km from the Wagha border. India cannot afford to take it lightly when there are clear indications that the government in Islamabad finds it difficult to ensure that its writ runs in the border areas near India. 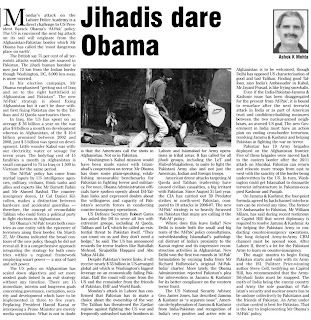 There is a need for the US to put greater pressure on Pakistan to fight against the threat posed by the terrorists. It should insist on Pakistan demolishing the infrastructure the terrorist groups have built on its soil with Islamabad’s approval. Veterans in the armed forces, read retired military men, are just that; yet, unlike others who have done duty for the government, they are in a class of their own. Many of the privileges enjoyed by those in uniform are also available to them. They have a retired Armed Forces Identity Card, which gets them entry into places that might not be accessible to most and has other benefits more unquantifiable, getting off some indiscreet driving on the road being only one such. Canteens and the associated facilities are available to them in the same way as they are to those in service. They get concessions on air and rail tickets and, in not a few states, their wards are also eligible, along with those of serving personnel, for seats specifically reserved for this category in educational institutions, including engineering and medical colleges. They can purchase motor vehicles at a considerable discount just as uniformed people can. They have shed their uniform and yet not shed it; on some occasions — for example, Army, Navy or Air Force Days and other ceremonial parades — they can wear their medals in the same way that their successors in uniform do. At many functions hosted by the uniformed military community such as regimental get-togethers, Infantry Day celebrations, etc, in the Army and equivalents in the other two Services, they get invited which is not common in, say, the civil services or in the private sector. In short, they continue to be “military” and are treated as such by those still in uniform even if they themselves have put their uniforms in naphthalene or dispensed with them altogether. Therefore, when some of them — yes, some of them, not the great majority — agitate in the way that they have been doing for the last few months, there is need for some self-introspection. Actually, agitation in the military itself is not something new. In the Navy, there was a “Topass” episode in the early 1960s. This category of sailors who attend to toilets and bathrooms in ships, and also carried out combat duties such as loading of guns during the days when these things were not automated, is not there in most other navies and the leadership felt it desirable to make this change which would mean that these duties would need to be shared by everyone on board. Understandably, this aroused great resentment in the “upper classes” and led to quite a few unwholesome incidents which, in the military, are classified as “mutinous”. The order was withdrawn even as several agitators were thrown out of service. In the 1970s, sailors in a major warship did not have their meals to protest a perceived grievance and this again was viewed as a “mutinous” conduct; over 100 men were dismissed summarily, and many others who were retained, just withered away, their records permanently blackened. Then, there was the agitation of Sikh personnel who wanted to keep open beards. Following the 5th Pay Commission awards, technical personnel of the Air Force, officers and men, agitated as they felt discriminated against their “flying” counterparts. 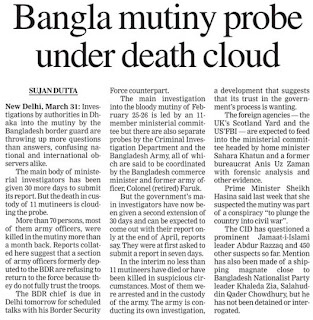 In all these cases, the Services viewed the agitations as “mutinous”. They may have been dealt with in different ways but on the manner of these protestations, there was clarity. It was simply unacceptable. So, what is one to make of the present-day scenario in which former military men, who had viewed these episodes in their own time as “mutinous” now themselves go on hunger strikes, return their medals and resort to other such means of agitation to project their grievances. In what way is this different than what was done by the sailors in INS Mysore in 1973 when they did not eat their lunch? The demand for “one rank one pension” or “rank-based pension”, as it has now been termed, is undoubtedly legitimate and must be fought for; it is the methodology being adopted by some that is in question. On more than one occasion, the veterans’ cells in the major political parties have succeeded in getting this issue on their party’s election manifestos; sadly, it has not, subsequently, been implemented. It is more than likely that this will be done once again for the ensuing elections and there is no knowing whether the follow-up will be any different this time. There is an alternative available which is to seek judicial intervention which would force governmental action. As it happens, in a recent order regarding pensions of Major-Generals, the Supreme Court has commented critically against the irrationality and injustice of not treating people who have held the same rank at different times at par in regard to their pensions. This must be taken further to cover the entire spectrum of ranks which is unique to the military. In fact, this process has been going on for decades with some “ad hoc” measures having being taken by the government through a “one-time increase” some years ago but without accepting the centrality of the demand. A battle has been won but the war must go on. There can be no doubt in any veteran’s mind on this score. The Navy Foundation, an association of retired Navy people, has, correctly, decided to file a suit in the Supreme Court seeking the necessary injunctions to the government. Hopefully, this will achieve the desired result. Having said this, nothing should be done which should deconsecrate the uniform that all of us have worn with such great pride, including the medals that go with it. Indeed, it is sad that many who have now made such an issue about having had to return their precious possessions, do not care to wear them proudly when they should. Having attended Navy Day receptions every year and similar functions of the Army and Air Force fairly often, this writer has been distressed to see how few of the veterans wear their medals on these, undoubtedly, ceremonial days. Even more disheartening is that even at a function of former military men held in NOIDA recently to pay respects to those who gave their lives in the service of the nation, only a handful of the 200-odd former Servicemen present chose to put on their medals. If there is something honourable in an item of uniform, there must be pride in displaying it on one’s person; then there is greater credibility in giving it up as a “strategy”. Even more, the agitators must reflect on the message they are sending to their young successors, now in uniform, who still see them, hopefully, as role models. If these agitational methods are good for the veterans, they are good for them. After all, the road-map and traditions that they are following are the ones that have been charted for them by those who were there not so long ago. No, this is not the military way of doing things. The writer is a former Commander-in-Chief of the Eastern Naval Command. NEW DELHI, March 31: The brazen attack on the police training school at Manawan off Lahore, barely 12 km from the Wagah border, is a chilling reminder of the growing Talibanisation of the region. It should be a cause of great worry to India since an unstable Pakistan, controlled by fundamentalists, will only result in further challenges, say analysts. Though the situation in Pakistan has been shaky for some time, Lahore and the Punjab province were generally perceived to be safe. No one had predicted that the reach of the Taliban had extended to Lahore. Yesterday’s attack, therefore, came as a big surprise. 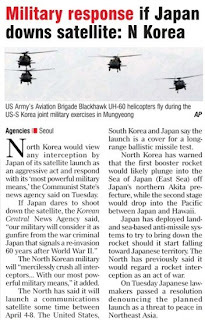 Not only should this ring alarm bells in Washington DC, it should also leave the mandarins of South Block worried as it raises a security threat to India. The Taliban have demonstrated with yesterday’s attack that their reach is deeper than what many policy makers believed, analysts pointed out. Not only do the Taliban have a vast army of jihadis, they have also long been trying to procure an atomic bomb from the black market. US envoy Mr Richard Holbrooke will be visiting India in early April and India is likely to discuss the region with him and give him inputs. But India must realise that it has to now push for stability in Pakistan, the analysts said. A strong leader like Mr Pervez Musharraf may be able to reign in the Taliban better, they said, adding that the USA must also understand that given the situation in Pakistan, a benevolent dictator may be a better bet than an ineffective President Zardari. Defence minister Mr AK Antony, today chaired a high-level meeting of officials and service chiefs to review coastal security and asked all concerned agencies to plug gaps within a definite time frame. As many as 139 students were selected out of the total 614 of 2009 batch, who appeared for the fast track selection process, conducted by Indian Air Force (IAF) at Chandigarh Engineering College, Landran. A press note of the college said a team led by Captain Ravi Sharma, Wing Commander Venkatesh and Wing Commander Chargeman conducted the drive that saw students from various colleges of Punjab, Haryana and H.P. as participants. Captain Ravi Sharma said Chandigarh Engineering College is among the selected recruitment centres that had been established by the IAF as a platform for the engineers of the northern region aspiring to join the Armed forces. The selection process included screening test based on general knowledge and English language testing skills. The candidates who cleared the screening test were administered picture perception and discussion test. Those selected had been issued letters to appear before Air Force Selection Boards. The selected BTech students will be joining the IAF as Flying officers, while MCA selected will be joining the meteorological branch. PUNE: Lt Gen R K Chhabra, the Chief of Staff (COS) of Southern Command, retired on Tuesday after serving the nation for 40 years. An alumnus of the Indian Military Academy, Dehradun, Lt Gen Chhabra was commissioned into 4 Gorkha Rifles on 21 December, 1969. Soon after commissioning, he took part in the 1971 Indo-Pak war in Chamb-Jurian Sector. And after years of regimental service and staff appointments, he graduated from the Staff College, Camberley (UK) in 1981. He had commanded a battalion during Operation Rakshak, an infantry brigade during Operation Vijay, a mountain division in Jammu and Kashmir and Gajraj Corps, which was deployed in Operations Falcon, Rhino and Orchid. He has held a number of prestigious staff and instructional appointments, including Directing Staff at the College of Defence Management, Brigadier General Staff in Srinagar and Chief of Staff of a strike corps. He has a vast experience in counter-terrorist operations. Lt Gen Chhabra is also an alumnus of the National Defence College, New Delhi and holds a double master's degree in Military Science and Management Science. He was the Director General (Operation & Administration) of the World Military Games, which was held in Hyderabad/Secunderabad in October 2007. The General Officer is a recipient of Ati Vishist Seva Medal, Vishist Seva Medal and Chief of Army Staff (COAS) Commendation Card for his dedication and meritorious service to the nation. Lahore After a siege of several hours, Pakistani security forces have recaptured a police training compound in Lahore that was stormed by militants armed with grenades and automatic weapons. Dramatic video of the incident shows army troops storming the facility; several attackers were reported captured. The attack in the capital of the province of Punjab should prompt some major concern about the internal stability of Pakistan: It comes less than a month after gunmen assaulted a bus carrying members of Sri Lanka's cricket team in Lahore. And today's gunbattle echoes the 2008 Mumbai siege that raged for three days and claimed around 170 lives. While Pakistani forces marked the recapture of the facility with celebratory gunfire, a serious question looms: Could the United States become more directly embroiled in Pakistan's internal affairs? Pakistan is now a central front in the administration's campaign against militant extremists, but President Barack Obama has pretty much ruled out U.S. combat troops in Pakistan. 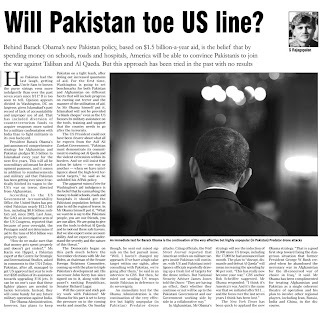 While the United States has around a hundred counterinsurgency advisors in the country, top U.S. envoy Richard Holbrooke has described U.S. or NATO combat troops in Pakistan as a "red line" that must not be crossed. U.S. strategy in Pakistan is supposed to center on a significant boost in civilian aid, along with continued military assistance (and the occasional U.S. drone attack). But as Noah has suggested here before, when you say you're going after al Qaeda and its allies in the region, you are potentially expanding the roster of militant groups on the "to do" list.